Is this an IWS on a Stump? Yep. Cooper is parked on a log as we look down range while the bird launchers are being loaded. This is actually a hunt test simulation that replicates conditions seen in flooded timber. 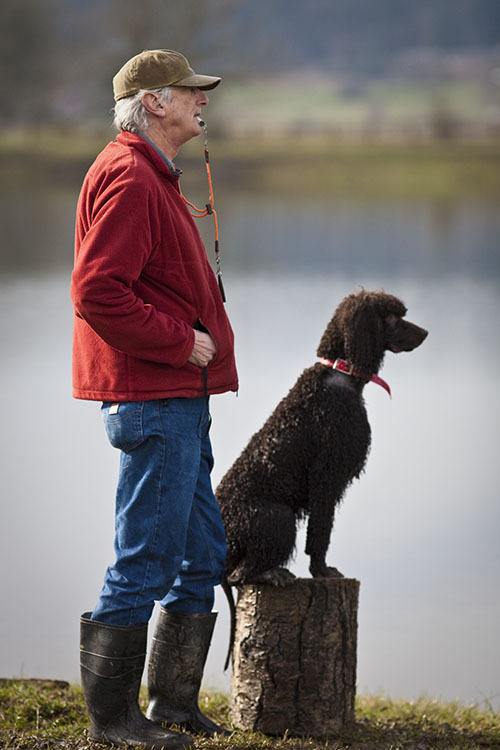 In that situation, the hunters may be in a blind or boat while the retriever is parked nearby on a stand set in the water or on the side of a tree. The issues for the dog and handler are that distance between the two is increased and only a voice command or stern look can control a rambunctious puppy. And with a high and small perch, a dog that tends to break or squirm before being released falls into the water. Not good form. For a dog to mark multiple birds, he needs to be able to turn its head and look in each direction while keep his aft end glued to the stump. How did Cooper do? Well, after the second shot, he fell off, but immediately sat on the ground until released. For the rest of the dogs, we got a bigger stump with more stability. Notice below the correct way it should be done. 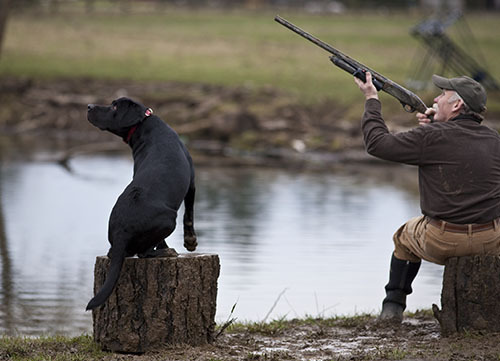 The dog follows the muzzle of the gun, looks skyward over his shoulder, marks the incoming bird, and still stays sitting on the log (the new and improved version – stump 2.0). Even Cooper could have stayed on a stump this size. Sometimes a dog is just a dog. A regular family member. Hanging out in the evening, providing moral support when necessary. While the Rose City Classic dog show was underway in Portland, I spent the weekend in Rainier, Oregon, participating in a seminar on how to run and judge a UKC Hunt Test. The seminar was hosted by the Lower Columbia Hunt Retriever Club (a UKC affiliate) and held on the grounds of Parkdale Kennels. The regional representative from the Hunt Retriever Club (UKC) gave a classroom session on Saturday. On Sunday we moved outdoors and the group designed a trial for all three levels: Started, Seasoned, and Finished. 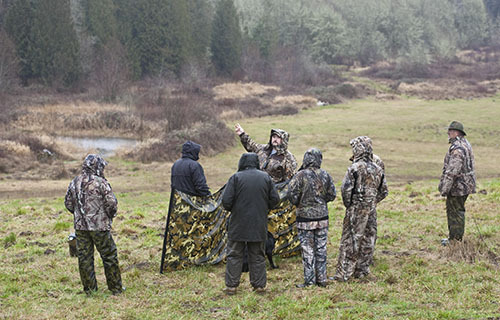 As the Oregon winter rain flowed from the sky, everyone was in their mandatory water proof camo clothing (see page 8 of the rule book) as we placed the bird launchers and discussed the tactics. In the advanced trial (Finished) of the UKC, a dog must “honor” the retrieve of another dog. This means it needs to sit quietly, unrestrained, while guns are firing and the other dogs are working the course. 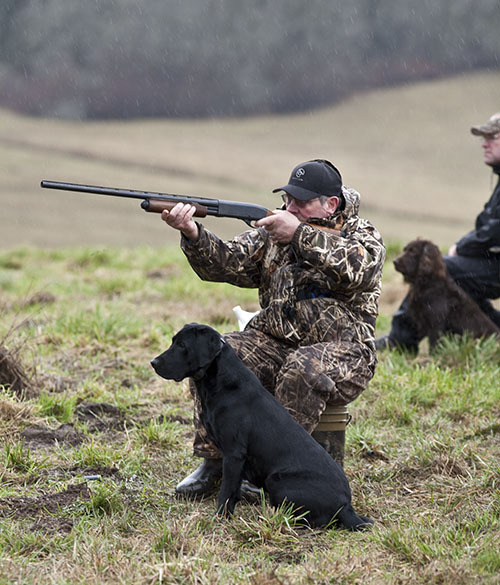 A feature that distinguishes the UKC hunt trial from an AKC, is the handler of the dog also shoots at the birds while his or her dog sits. This is to simulate real hunting conditions. 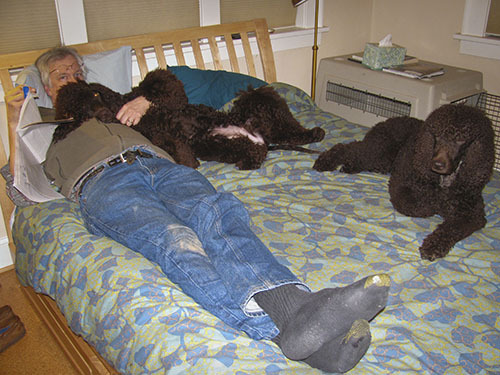 Below is Butch from Parkdale Kennels with one of his Labs and Earl, the Boykin Spaniel, sitting by in a good honor. And one more important distinction between the UKC and AKC retriever hunt tests is which dogs are allowed to compete. The UKC is open to more breeds and mixes as it is focused on the hunting experience and less on maintaining the arbitrary “Purebred” experience. 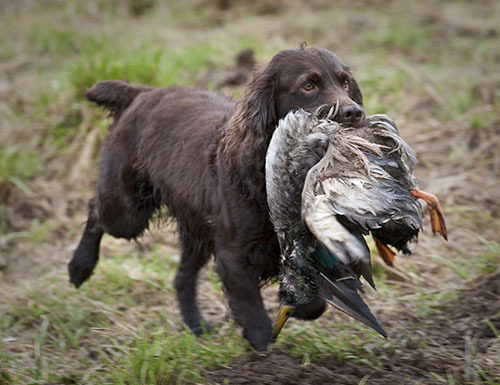 One such example is the Boykin Spaniel, a very versatile retrieving dog that is not much larger than some ducks. Pictured below is “Earl”, from Deer Island, Oregon. He is a top champion who competes at the national level in the UKC Grand series. In the world of Labs, it is great to see a 25 lb. dog zoom out 200 yards straight to the bird. 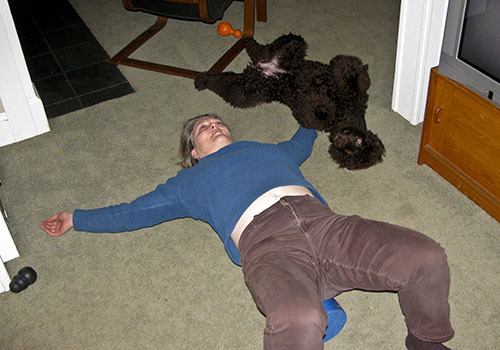 And with all this talent, Earl is not eligible for an AKC retriever hunting test. I really, really wish I had taken a picture of Tooey before I dropped her off with Stacy last evening, so I could show you the transformation. She went from looking like a raggedy Muppet to a sculpted paragon of IWS beauty. Rosemary reminds me that winning in a dog show takes more than a beautifully groomed coat. I know that’s true. A dog also needs structure and movement and attitude. I know that. But, wow. Tooey looks like a fairy-godmothered show princess. Let’s hope she also moves and behaves like one in the breed ring tomorrow and Saturday. And I should add: Let’s hope I remember to breathe and don’t fall all over myself while escorting Tooey around the ring. Can he do a decent box turn? Can he pass another dog without stopping to discuss? So, yes he can do a decent box turn. What we’re looking for is called a swimmer’s turn. Hit the box sideways with all four feet (triggering the ball), grab the ball, and push off with same said four feet. You might notice a clear barrier right in front of the box — that’s there to force Cooper to pick up his back feet just before he hits the box. Otherwise, it would be way too easy for him to hit the box with just his front feet. That’s not only slower, it can also cause injury to the dog’s shoulders over time. We’ll use that barrier at all times except in the actual tournament, just to build in the muscle memory of the swimmer’s turn. And can he pass another dog? Well, it depends. In the video, Cooper did really well passing a little, light-colored dog, and today in regular practice, he did fine passing a Chihuahua, going straight out to the box and straight back. And he’s fine with all dogs when he’s returning to me with the ball. But he’s not so fine going out, passing bigger dogs who are coming back. With those dogs, he turns his head and body toward the other dog, slowing himself and the other dog way down. It’s not clear why he’s doing that — lack of confidence? trying to protect me from this big dog that’s rushing toward me? trying to play? challenging the other dog? But whatever the reason, whenever he does that, he gets pulled from the race and doesn’t get to play any more for awhile. You can see in the video that he REALLY wants to play. I’m hoping that not letting him play every time he pulls that stunt will get the message through: Ignore the other dog and GO GET THE BALL! So it’s clear: We need more practice. More chances to do it right and keep playing. More chances to do it wrong and get pulled. More chances for the connection to be made and the light bulb go on. I’ve been working with Rosemary to get a Realta IWS website going. If you notice any similarity to my blog — well, that’s not coincidental. I’m not really a web developer, so I am just going with what I know. 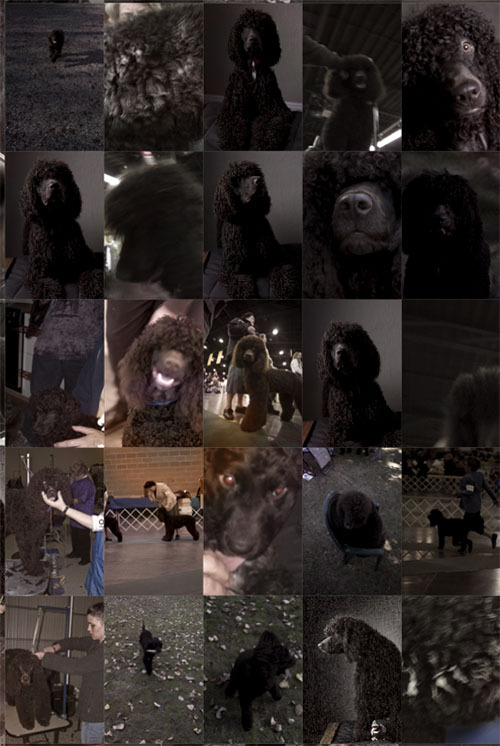 In the last 3 years, I have taken and archived over 5000 photographs of Irish Water Spaniels. Mostly of Cooper, quite a few of Tooey, but also hundreds more at dog shows, hunt trials, and dock diving events. This archive is now sufficiently large that I can find enough good selections to build a mosaic image from just my own IWS images. 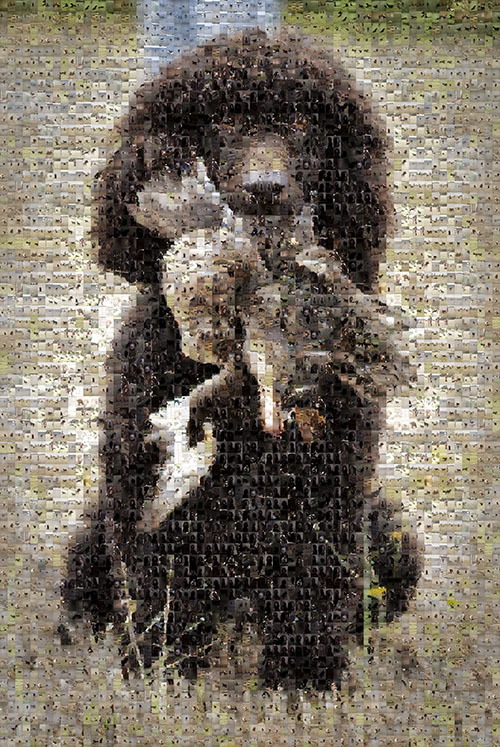 I selected an image of Cooper with a duck (you can see the original in a past entry), crunched through the files, and this photo mosaic is the result. It is made up of 4,356 separate tiles, and about 3000 unique images. (Actual size is 24 x 36 inches.) The pictures include many of the people mentioned in this blog, usually at a dog show, at a grooming table, or having fun with their IWS. The detail below makes up a section around the right eye.